MSC Seaview will spend her inaugural summer season in the balmy Western Mediterranean, where MSC Cruises‘ expertise is unparalleled. A MSC Cruises vacation is the perfect way to discover different cultures, beauties and tastes and guests will be able to experience the wonders of the Mediterranean in true MSC Cruises style. MSC Seaview will have three historic Mediterranean homeports: Genoa, Marseille and Barcelona and will also call at popular Mediterranean destinations including Naples, Messina and Marseille, where guests can benefit from a wide range of shore activities that will help them discover the region. As the weather gets cooler in the Med, MSC Seaview will make her way across the Atlantic to introduce her guests to the vibrant culture of South America. Cruising from Santos, the port for Sao Paulo, MSC Seaview‘s South American itineraries focus on the lively coastal ports and towns of Brazil. Pick from a short three or four night taste of Brazil or seven night Brazilian discovery. View all MSC Seaview cruises, view a selection of MSC cruise deals, or view more options for MSC cruises. 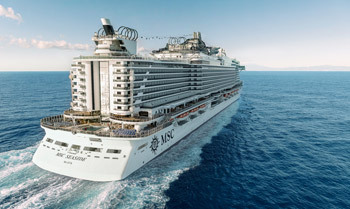 MSC Seaview is the second of two identical ships in the Seaside generation, her sister being the MSC Seaside. At 1060 feet long and at 154,000 tonnes, the ship will feature a maximum capacity of 5,429 guests. The MSC Seaview Waterfront Promenade circumnavigates the ship and offers access to a wide variety of restaurants, bars and shops. From the glass skywalk, guests can enjoy a jaw-dropping view of the sea from above.